The Washington Post on February 5, 2008 published a story of a woman who had a chronic cough that never seemed to respond to typical treatments. Only after undergoing a bronchoscopy test was diagnosis reached... a fungal infection of her lungs. A chronic cough behooves a THOROUGH investigation of all possible causes and which unfortunately requires a multitude of tests before an explanation may be found. 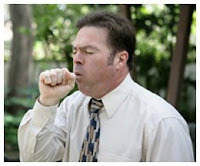 Read more about chronic cough and the workup here.